Cinnamon is native to Ceylon (Sri Lanka). Cinnamon AKA “true” cinnamon is a spice that is made from the inner bark of the tree called Cinnamomum. The pungent aroma of cinnamon is unmistakable, usually evoking dreams of hot cinnamon rolls from the oven. Cinnamon is a spice used by many different cultures as seasoning for savory and sweet foods. There are different varieties of cinnamon. Cinnamon cassia is the more common variety and it may already be in your spice cabinet. But Ceylon cinnamon is different than the other varieties. It has a distinctive shape, lighter color, and delicate taste. Once upon a time, cinnamon was more valuable than gold. And while these days, most of us would rather get our hands on a gold bar over a brown stick, this bark has just as much bite as it does bark. The world’s most popular baking spice, cinnamon’s distinctive taste and aroma is enjoyed solo, think cinnamon rolls, and in combination with other warm spices like cloves, nutmeg, and allspice like in cakes, cookies and fruit crisps, breads and pies, puddings, ice cream, you name it. Try it in hot drinks like cider, coffee, tea, and cocoa, too. Cinnamon powder has long been an important spice in enhancing the flavor of any dish. 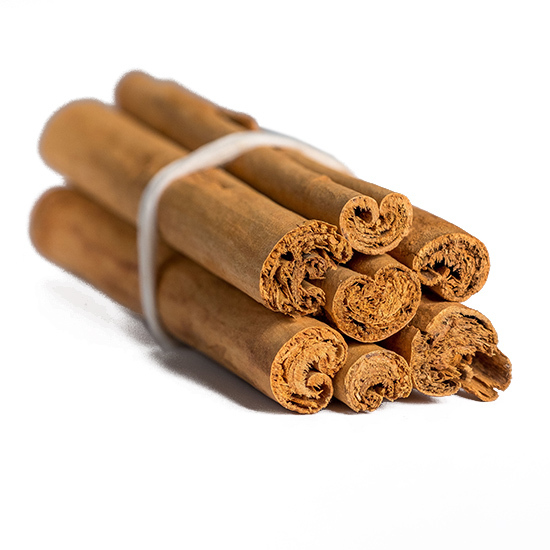 Cinnamon is an evergreen tree that is characterized by their oval-shaped leaves and thick bark. Grow Ceylon cinnamon in full sun to part shade. The tree prefers higher humidity but will tolerate lower levels as well. Cinnamon trees will grow for 2 years, then when the bark starts to look brown cut it down 1 inch from the ground. The stems must be processed immediately after harvesting while the inner bark is still wet. The tree gets pounded on, so the inner layer will loosen and once the bark gets removed the inner rolled layers are dried and that is, as we know it, cinnamon quills.